The last time we mentioned CRON was back on December 7th, and to kick things off this week we wanted to point out the fantastic run the stock has been on since then, even through the tumultuous end to 2018 and beginning of 2019 that was experienced by most stocks. Subsequent to the time of our last alert, CRON was trading as low as 9.56, and the run it’s gone on since then has been incredible. It hasn’t really experienced any kind of downtrend since the week of Christmas, and on Friday, reached a new high of 21.79. That works out to a very respectable five week swing amounting to 128% For a nearly ten-dollar stock that’s an absolutely fantastic run. We’ve seen it inch higher in the premarket today, so we’ll definitely allow CRON to continue to keep its spot on watchlist. and we are pleased to recall the excellent performance those contracts posted on the day. Our regular readers know that quick-strike options trading of plays that have just seen their quarterly earnings releases are among our favorite scenarios. The volatility afforded to us by these events is key to the type of opportunities we are commonly after. This morning, we have NKE which has untraded-upon earnings reported in the post-market yesterday, and Carmax which dropped its report in the premarket today. We’ve got a set of bearish ideas for NKE and bullish ideas for KMX. We also have a longer term idea for the FSTR chain. As you can see on the chart snapshot we’ve included below, the stock is presently exhibiting a strong multiple-bottom. 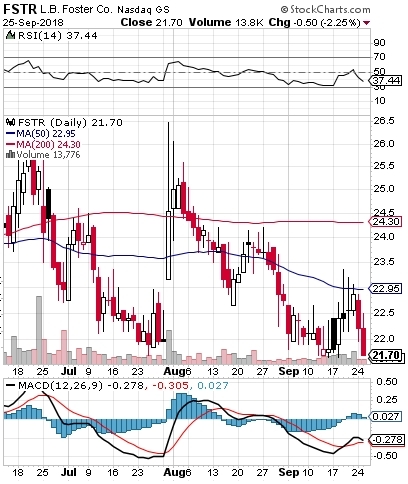 We’re going to place the FSTR 10/19 $22.50 & $25 Calls on watch in the likely event that a recovery does occur. On Friday morning we spent most of our report updating readers on several great stock calls we’ve made in recent weeks, but we did include one fresh options trading idea, and we’re pleased to report that it was a resounding success, and a greta opportunity to daytraders to nail down some quick profits. Our quick-strike options prowess has been second to none for quite some time now, and MU was another shining example of that! Big cheers to anyone who was able to take advantage. For a fresh idea, we’re going to signal a longer-term set of contracts in the ADBE chain. The stock has a fairly predictable trading pattern, and appears to be approaching an up-cycle in the days or weeks ahead. If we can see ADBE maintain support at or above 258.49, we are going to be very interested in the ADBE 10/26 $260-265 Calls. Also in Friday morning’s report was a tag of AWSM. We had just noticed it’s big day in the prior session, and included it in our daily watchlist. The stock made an absolutely monstrous single-session run for something trading in the $11-range, running from a low of 11.11 to a high of 22.61 for a 104% intraday move. It also closed more than 80% in the green on the day! Our primary focus has always been to find near-term trading opportunities first, assigning longer-term calls a secondary priority. However, we’ve had quite a bit of good fortune this year in identifying stocks that have gone on to have considerable extended runs. HEAR is one such stock, that we first signaled for observation on April 9th, at which time the stock was trading for as little as 2.76. Over the ensuing nine weeks, we have seen an incredible, near-continuous bull run that has resulted in new highs of 23.20 yesterday. That works out to an increase of 740% over a span of a little over two months! Being in blue skies, there’s no telling what new highs we might see in HEAR; it’s certainly plausible to believe we may see our total observed gain reach a thousand percent at some point in the near future. At the rate things have been going, it’s certainly not an unreasonable thought. We also want to provide a quick update on our bearish options idea from yesterday’s premarket report, the HRB Weekly $26-24 Puts. We formulated this range after noticing the stock getting kicked hard despite posting an earnings beat in the post-market on Tuesday. HRB did gap down a little too far for the $26′s to see much action, but we had respectable chances to profit off of the other two contracts in the range. The $25 Puts ran from .65-1.05 for a gain of 62%, while the $24′s put up a double-bag performance with a 133% rip from .15-.35. We tagged GALT on Tuesday morning after noticing a big surge in activity, and its run has continued nicely over the course of the week. We’ve now observed a solid 37% bullish move from 5.83-8.00, and will be on the lookout for the possibility of more new highs. After noticing its solid beat on earnings and reassured guidance yesterday morning in the premarket, we selected a range of options ideas for the SIG chain. Post-earnings options calls have become our bread and butter, and SIG provided yet another example of the reason for that. Our designated observation range was the SIG Weekly $47.50-50 Calls and all but the 49.50′s enjoyed considerable single-session gains for the day. We also included a tag of AXON in yesterday morning’s report, and were met with a pretty good chance for a daily profit there as well. We noticed a slew of Form-4 buys come in on Tuesday, and lo and behold, yesterday the company released news of an $840M+ licensing deal for its Parkinson’s gene therapy. From a morning low of 3.27, the stock reached a high of 4.64, representing a modest, but very respectable 42% move on the day. We’ll be sure to leave it on our radar in the event that a more sustained move is in the cards.